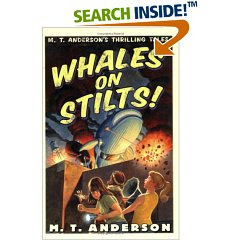 Whales on Stilts by M.T. Anderson. Series: M.T. Anderson's Thrilling Tales. Library Copy. 2005. The Good: It's not just that I grew up reading series books; I grew up reading series books from every decade. Mary Rose at Boarding School (still cannot find much online about them). The Outdoor Girls of Deepdale and their (god help me I'm telling the truth) Camping and Tramping Club. The Happy Hollisters. So reading these books, that are tribute to those series, is great. It's tribute and love song, yet laughing at the same time, mocking with love. Will kids today like them? Well, I don't think kids who are readers have changed. They still delight in the box of books at a grandparent's house, the dusty books found at a garage sale. And so, yes, they will like these books, also. Plus, even if they don't get the homage to those earlier books? This is still a funny, adventurous tale. Kids who want humor? Give them this. To begin with: "On Career Day Lily visited her dad's work with him and discovered he worked for a mad scientist who wanted to rule the earth through destruction and desolation." Could there be a better opening line? Or summation of a plot? Lily herself is quietly observant: "Lily believed that the world was a wonderful and magical place. She believed that if watched carefully enough, you could find miracles anywhere." Jasper, meanwhile, has stepped right out of those old series books I adore. He goes around saying things like, "Dash it all, chums, this sounds a mighty pickle." He is very proud of his photocopy machine, which involves a mule on a treadmill. Jasper speaks as if he's from the 20s, with a view of the future that is 80 years old. But, as I said, you don't need to know that Katie is RL Stine come to life or Jasper a throwback to the 20s/30s to enjoy the humor. Dad works in an abandoned warehouse on edge of town. With a receptionist. That, my friends, is the type of humor I adore. An abandoned warehouse where the father doesn't realize something is up, is just plain crazy; add in a receptionist for the evil people? And chums, it is brilliant. There is a sequel, which I haven't read yet; and a third book! Via NPR, hear MT Anderson read the first chapter. "I'm sure the Winchester boys will be visiting any time now. And Katie will kick their asses. (Yes, I'm in denial about Dean. So?)" I'm not in denial at all. Either Sam will get him out or Dean will crawl out on his own and it will be marvelous TV. And Katie would so kick their asses. I'm giggling madly just picturing it.